I promised you a recipe combining the Cranberry Vanilla Bean Caramel with chocolate, so here it is. My family decided to do mini desserts for Thanksgiving this year. I highly recommend this approach to holiday desserts. Everyone is always so stuffed after dinner they can barely choke down a whole slice of pie, let alone two. But mini desserts? Somehow everyone managed to find room for two or four of those. Especially these bite-sized cranberry caramel filled shortbreads topped with chocolate ganache. I’ll give you a minute to really take all that in. dolloped it into crunchy, salty chocolate shortbread shells, and then topped it all off with a rich, creamy, decadent dark chocolate ganache. If your mouth isn’t crying for one of these right now, you should probably see a doctor ASAP. I know it probably sounds like I think everything I make is the Best Thing Ever, but these mini tarts are now near the top of my favorites list. They’re so good, my family advised me to quit my day job and open a bakery. I highly recommend you make some of these for your next holiday gathering. I had some trouble figuring out the best way to get these tarts out of the pan. Baking spray in my first, slightly less non-stick pan yielded some stuck shells that broke when I tried to get them out. Generously buttering my other very non-stick pan the second time had the shells pop right out, but left them somewhat crumble-y around the top. Whatever you do, generously grease your pan. If you have a mini cheesecake pan with removable bottoms, that would probably work best. Prepare the Cranberry Vanilla Bean Caramel according to directions. Chill. Can be done up to a week ahead. Preheat oven to 350°F. Generously butter or coat with baking spray one 24-cup mini muffin tin, two 12-cup mini muffin tins, or a mini cheesecake pan. In the bowl of a stand mixer, add sugar, flour, cocoa powders, baking soda and salt. With the paddle attachment, mix on low speed (with a towel over the mixer to keep the dust down) until combined. With the mixer is running on low, add butter a few pieces at a time, waiting a moment after each addition. Once all butter is added, continue to beat until sandy mixture gathers into a ball of dough. Dump the dough out onto a floured or parchment/wax paper covered counter. Using your hands, form dough into a roughly 5 x 7-inch block. Cut block in half. Working with one half at a time, roll out dough to between 1/6 and 1/8 inch thickness. Using a 2-inch round cookie / biscuit cutter (or one slightly larger than your muffin tin cups), cut out rounds of dough. Gently place each dough round into a cup in the prepared muffin tin(s), folding over dough and smoothing sides as needed to form a shell. Gather scraps, re-roll, and cut out more circles just once. Using a small fork, lightly prick the dough at the bottom of each shell to prevent it from puffing up too much. Bake at 350ºF for 12 minutes. Remove from oven, cool 1 minute. While tart shells are still hot, use the bottom of a slender glass (I used a shot glass) or the handle of a wooden spoon to reshape the hollow space in the shells for maximum filling space. Cool to room temperature. While caramel chills, make ganache. Warm chocolate chips and heavy cream in a small saucepan over low heat, stirring frequently, until a smooth chocolate ganache forms. Remove from heat and cool for about 5 minutes. Place a dollop of warm (not hot) ganache on top of each filled tart. Chill until ganache is firm. Tap pan upside-down to release tarts. Refrigerate tarts until ready to serve. Can be assembled 1-2 days ahead and kept refrigerated. The tarts can be enjoyed straight out of the fridge, but are best when set out at room temperature for about an hour before serving. Yum! Still haven’t gotten around to making the cranberry caramel, but I’m going to rectify that soon. I did make some of your pumpkin pie pudding and it was goooood. 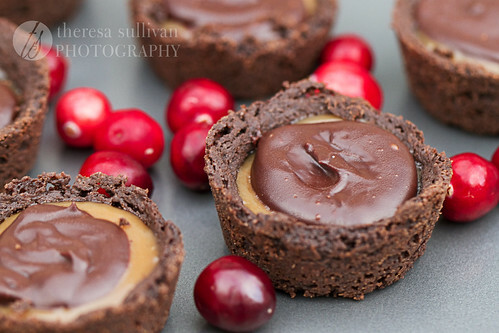 I just got some cute mini pie/tart pans and they would be perfect for these tarts. These look gourmet and so decadently delicious!! Good lord, woman! I want! We did mostly small desserts for Thanksgiving this year as well and I agree, it works well. Oh my! This is so not fair! My pants are gonna be so mad at you! 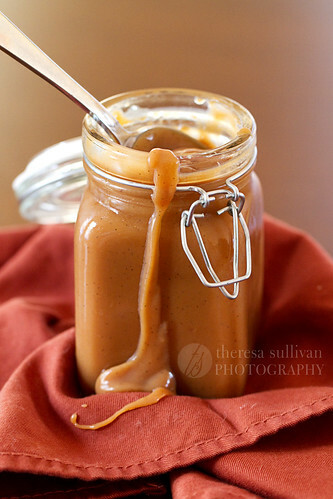 I do love me some caramel! Just found your site. Thanks! These are positively dreamy! And did you say cranberry caramel? I would of ate it all with a spoon and had nothing left to bake with. So irresistible! These sound delicious and cute. They look like little bird nests :) I’m sure, however, that they are far more tasty!